You can use Phone Amego with Bluetooth cell phones that have been paired with your computer. You can monitor upto 8 cell phones at the same time for Caller ID, and select which one will be used for dialing. 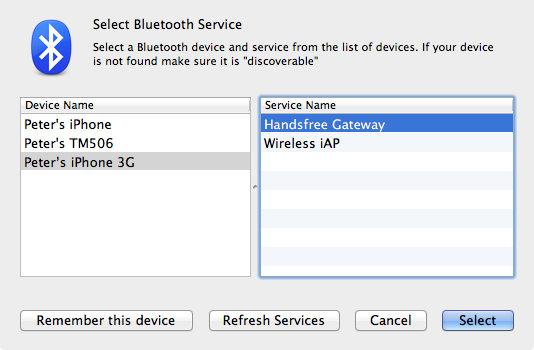 Click here for more information on configuring Bluetooth to "pair" with your phone. To add a device, Press "+" below the Telephone Devices table, select the kind of device you want to add, and then press Attach Device. It is possible that your phone offers more than one service that matches the Handsfree (HFP) or Serial Port Profile (SPP). I recommend choosing the first Serial Port or Handsfree Gateway listed. If that doesn't work, try the others. Once a compatible Bluetooth service is selected, Phone Amego scans to see if your phone is turned on and within range approximately every 30 seconds and will connect automatically as needed. Phone Amego works with many Bluetooth phones such as those by Nokia, Motorola, Sony Ericsson, RIM BlackBerry, Google Android, and Apple iPhone. Phone Amego uses the Bluetooth Handsfree Proflie (HFP) to connect with many Bluetooth cell phones. To your cell phone, Phone Amego may appear as a handsfree headset. When a call is answered, your cell phone will try to route the audio to your Mac. If you answered the call from your Mac, Phone Amego will accept the audio connection to become a handsfree speakerphone. If you answered to call from your cell phone, Phone Amego will redirect the audio back to your cell phone (by closing the connection). Some cell phones may try again to send the audio to your Mac or get confused. If you need to restore the call audio, reset the "Audio Source" to be your phone, or enable the speakerphone feature on your handset. Many phones support the Bluetooth Serial Port Profile (SPP) in addition to HFP. If you connect to your phone using the SPP, there will be no attempt to re-route the call audio to your Mac. In this case, you may be able to use a Bluetooth headset (HFP) with your phone along side Phone Amego that is using the SPP.